Had a bit of a race yesterday. Took all the LARAF birds out for a spin around the new track with surprising results! Su-22's accelleration is unmatched... but will her fuel supply be enough to keep this up? 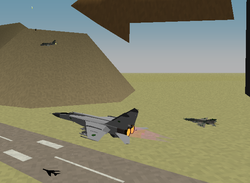 Mirage F1 had a slow start and is tailing MiG-23, hoping to outmaneuver her foes in the curvy canyons ahead! 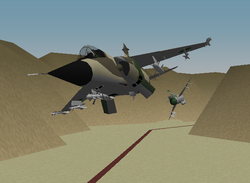 Meanwhile MiG-25 overtakes MiG-21 and Su-22, empowered by her mighty engines, the largest on the field! 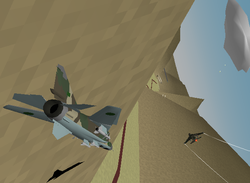 MiG-23 struggling with the rocky bends, while Mirage F1 is up one spot! 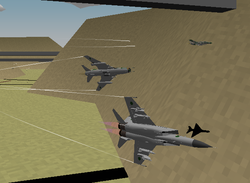 MiG-25 is losing ground for lack of maneuverability, as the others all blast forward! 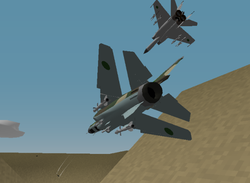 A duel ensues between MiG-21 and Mirage F1, both maneuverable and fast they are changing for pole position every second! 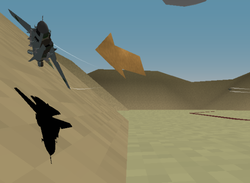 Meanwhile MiG-23 is struggling once more, having a hairy moment counting the pebbles on the mountainside! 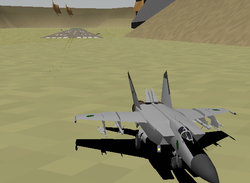 The steep corner is a warning for Su-22 in the back! 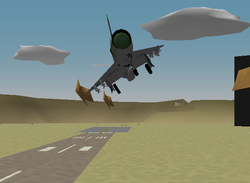 Mirage F1 slamming on the brakes before a turn, making it possible for MiG-21 to take the lead once more! 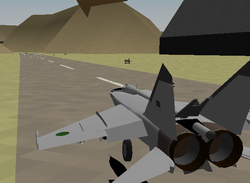 MiG-25 is surviving, but barely. The AAA keeps her down to tree-top level, and the turns make her deploy the brakes too much for comfort! She wasn't built for this! 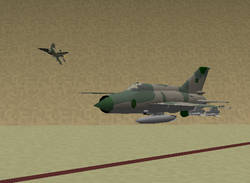 MiG-21 prevails! Mirage F1 lost it in the last two corners and is here seen making the last turn behind MiG-21 with the landing gear already down! 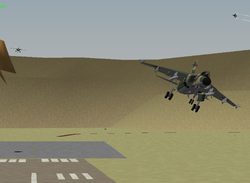 Mirage F1 shaken from last minute defeat lowers its landing gears while MiG-23 finishes at a surprising 3rd place! 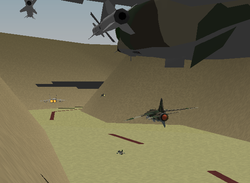 It is SU-22 risking her life in AAA range trying to make the final turn! Not used to being last MiG-25 finally touches down a few seconds later... She'll get them next time at 30.000ft! More than anthing this game called YS Flight can be a platform for learning about world history, the various aircraft and their history, and even the tactics employed by various sides in a war. I have made a Libyan battle scenery that loosely resembles the situation in Northern Africa. It features the cities of Benghazi and Tripoli, and a coalition island to the north. Also the carriers USS Kearsarge and Charles De Gaulle are in play, with a full deck of aircraft for better visual effect. There are two ground armies active on the ground: Qaddafi forces and the FLA. A NFZ has been in place and it's up to us as pilots to enforce it. 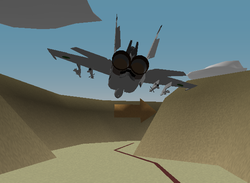 Of course, you can also choose to break the NFZ as a LARAF or FLAF jet. The nice thing about this map is that the primary targets are not the obvious ones. There are two large tank formations on the way to major tactical areas, and the rebels need your help (if you're on their side). As a NATO plane you are ordered to other targets instead, so it's up to your judgment to pick and choose which way to go. Agree with NATO or not, but the tactical support the NFZ is giving at the moment, is very little and in some cases even counter-effective to the rebel cause (which they claim to support). This scenery lay-out reflects that as well. As a little extra I have put in a race-course. 6 start positions provide for lots of fun flying through a bunch of gorges with AAA overhead to keep your face in the dirt. It is my hope that this scenery will become a server favourite, with lots of different aspects of YS Flight to be explored. Carrier operations, Marine Corps close Air Support, NFZ-patrols, defending the island against terrorist attacks, racing other players online, and of course hunting for Q himself (he's out there... find him if you can!). Sundowners released: New project - Fulcrum Fantasmagoria!! 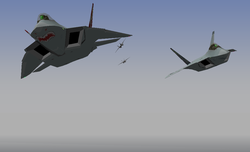 VF-111, VFC-111 and VFA-111 planes have been released in the Download section as a separate download. 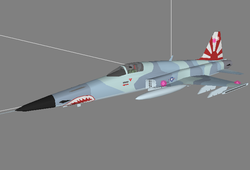 I've just started my new MiG-29 Fulcrum pack repaint from XLP. It began as a simple DPRK repaint but then I found all these amazing paintjobs out there such as Algeria, Sudan, the ex-GDR, Poland, Malaysia and maybe Romania if I feel like it. No screenie yet, but it's high detail and does the Fulcrum justice! Keep your eye on this blog! 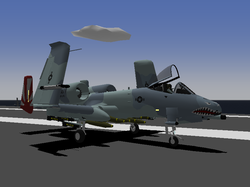 Navalised A-10 in VFA-111 colours! Oranleed's base model and my recoloured mod of last year. The triplets are all done! 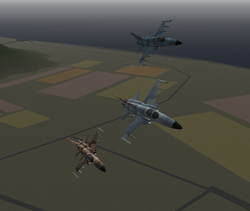 After all, the VFC-111 Navy agressor squadron with its trademark sharknosed F-5's are not to be neglected in any VF-111 pack. Since my original computer crashed I haven't been very active lately. 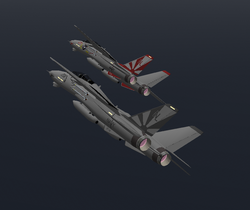 This morning however, I felt like creating a new VF-111 Sundowners aircraft, and I have repainted XPL's NATF F-22 into a fictional (the unit has been disbanded) VF-111 paint scheme both high and low vis. I live in Shanghai at the moment, spending far too much time on making planes.